The rights of Indonesia's tens of millions of indigenous people are not properly recognised under Indonesian law and forest-dwellers are at a particular disadvantage. Although some attention is given to customary law (hukum adat) in the 1999 Forestry Act and in other pieces of legislation, adat land rights are not recognised in forest areas because all forests are categorised as state-owned. 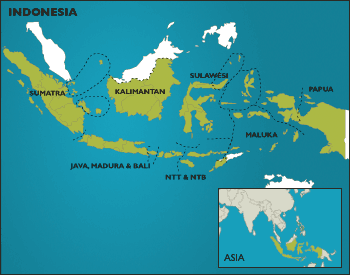 Regional autonomy - a workable solution for Indonesia? New laws on regional autonomy and financial control were passed by the Habibie government in 1999. Now, Indonesia is waiting for the regulations which will determine how the laws are to be applied. Implementation is planned for January 2001. But many questions remain about how far the Jakarta government will permit decentralisation to go and how much control it will really relinquish. Opposition is mounting to large-scale mining in Indonesia as communities speak out about its effects on their lives and the environment, but foreign companies are warning the Wahid government not to change the contracts they signed during the Suharto regime. Indonesia's foreign-dominated mining industry is on the defensive. On December 1st last year celebrations took place in towns all over West Papua to mark the 38th anniversary of independence, declared when the territory was still under Dutch rule.